The wait for India’s first sporty crossover bike is finally over with the Piaggio Group’s Aprilia SR 150 becoming commercially available today. Coming to the geography from the Aprilia portfolio, known globally for its undisputed racing heritage, the Aprilia SR 150 is targeted at patrons looking for the sensation of sports bikes coupled with the convenience of automatic scooters. Its unique crossover features coupled with its competitive pricing at Rs. 65,000/- make it India’s first 150cc gearless sporty crossover bike. With this addition to its India portfolio, Piaggio Vehicles Private Limited (PVPL) has introduced yet another innovation in India’s challenging two-wheeler segment and has extended its product portfolio from the iconic Vespa scooters to Aprilia, renowned globally for its undisputed racing heritage. Aprilia bikes are among the most technologically advanced in the market, since they use the racing platform to bring innovations created for the tracks to bikes designed for the roads. Built around Aprilia brand’s philosophy, “Designed For Racers, Built For riders”, the Aprilia SR 150 is being manufactured at Piaggio’s plant in Baramati and perfectly blends the cues of motorbikes and scooters. With this distinctive positioning, the Aprilia SR 150 is set to carve out a new category in the country’s booming two-wheeler market, which has evolved from being need-driven to one dominated by differentiation and aspiration. As an endorsement of the brand’s racing heritage, the Aprilia SR 150 launch event hosted at Hard Rock Café in Mumbai was attended by world Superstock champion Lorenzo Savadori from Italy, who has been associated with Aprilia since the start of his racing career. In 2015, Lorenzo won the world championship with four victories and seven podiums through eight races aboard the Aprilia RSV4 RF. 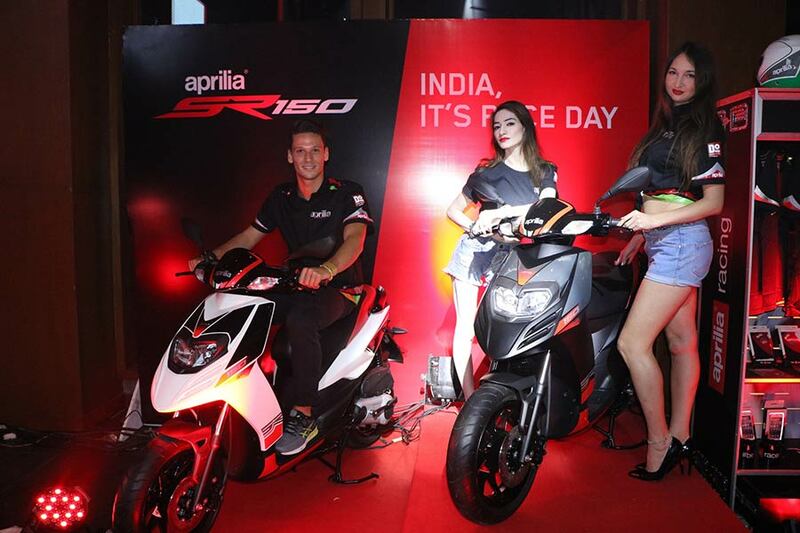 The launch event also saw the unveiling of an exclusive line of Aprilia merchandise which will be available through the India Motoplexes and dealerships across the geography. And if that was not enough, an Aprilia SR 150 experiential ride created at the venue through an augmented reality game added to the excitement of bringing the experience of the bike to life. It is with great pleasure and humble anticipation that we finally launch the Aprilia SR 150 today and extend our India product portfolio. Here at Piaggio India, we have all been waiting with baited breath to extend the Aprilia experience from the race track to the streets of India with the Aprilia SR 150. It’s racy, it’s sporty and it promises to be a cracker on the road! From the initial response received, it appears that the market has been waiting as well. With this truly unique and powerful crossover, we are confident about creating yet another first in India’s two-wheeler segment and continuing our vision to bring truly innovative and never-seen-before products to the market. I am thrilled to be here in the vibrant city of Mumbai, to represent the brand Aprilia which I am associated with. The brand represents beautiful and agile racing bikes which are designed for racers and built for riders. Aprilia SR 150 is an example of the brand’s philosophy – the crossover bike has all the elements of the racer bikes in terms of its looks, styling and experience of riding but on the other hand it is also as convenient as the automatic motorbikes. I’ve had a wonderful and thrilling experience riding Aprilia SR 150 on the Indian roads. It’s so Aprilia! India, It’s race day! The Aprilia SR 150 is characterized by an aggressive and sporty style. The distinct handlebar, the light unit included in the shield and above all the pronounced “beak” on the front wheel characterize the front end. 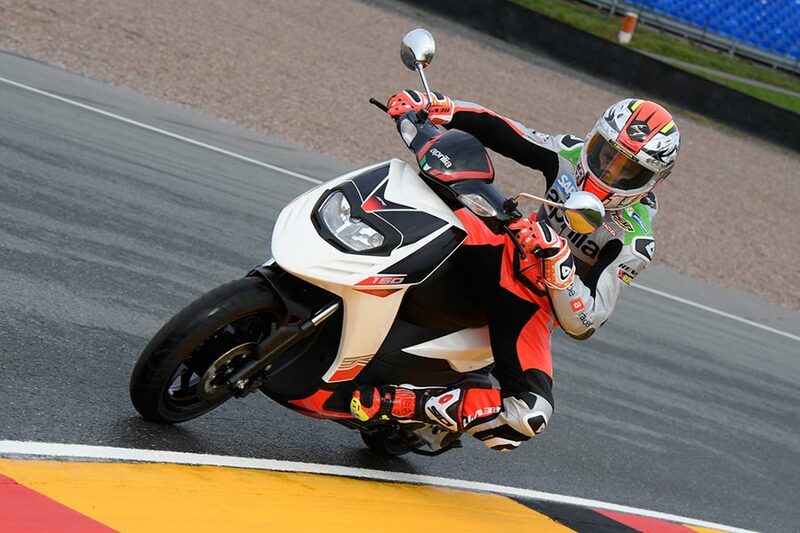 The large black 14″ alloy wheels with five spokes show off decisive and sporty design drawn from Aprilia racing bikes. And the raw power of 150cc enhances the liveliness of a vehicle born to make every city ride fun with 220 mm front disc and 140 mm rear drum brakes. 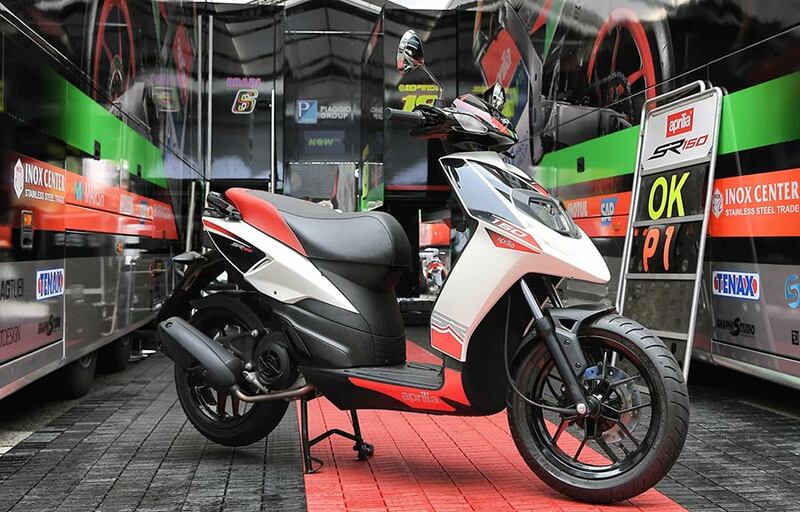 The SR150 scooter is a really good machine put together perfect by Aprilia. The price is surreal. The cheapest Aprilia money can buy. INR 65,000 is an introductory price for Aprilia SR150 and it might change in future.